Aphasia is a communication disorder that affects a person's ability to process and use language. It is a neurological condition caused by damage to the portions of the brain responsible for language, and it does not affect intelligence. Because language plays such a central role in our daily lives, aphasia can be very challenging. Individuals with aphasia may find it difficult to speak, understand speech, and read and write. Approximately 34% of stroke survivors develop aphasia, and there are between 2.4 and 4.1 million people living with aphasia in North America (source: Aphasia in North America, 2018). Despite these numbers, many people have never heard of aphasia, and some are unaware that they have it. When compared to stroke survivors without aphasia, people with aphasia typically participate in few social activities, are less likely to return to work, have a high risk of depression and emotional problems, and face higher healthcare costs (source: Aphasia in North America, 2018). While a diagnosis of aphasia can be a tough one, there is hope. Regardless of someone’s age at the time of aphasia onset, people CAN improve their functional communication skills. Speech-language pathologists, medical professionals, and caregivers/communication partners play key roles in the aphasia journey. Additionally, Lingraphica has conducted over 30 years of research, which serves as the foundation for the apps, therapy, and devices that we create to help people with aphasia. These tools help people find meaningful and helpful ways to share their wants and needs, personal information, and safety information, which includes information about pain or symptoms of illness. 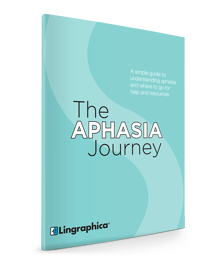 To learn more about aphasia and the resources available to those with aphasia (and those who care for and communicate with someone with aphasia), download our eBook, The Aphasia Journey.